This Wound is a World, Billy-Ray Belcourt. Frontenac House (2017). 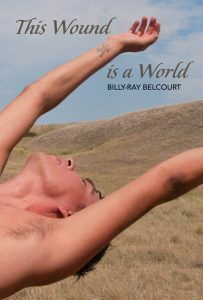 In her essay “Queer Feelings,” from The Cultural Politics of Emotion, Sara Ahmed writes, “Sexual orientation involves bodies that leak into worlds.” Billy-Ray Belcourt’s collection of poems, This Wound is a World, is “the water that comes before new life,” carrying a promise of possible world-building. Belcourt is both queer and Indigenous, writing from an intersection of marginalities at which he carves out room for re/defining what it means to exist at such a crossroads. He explores the potentiality of queer Indigenous sadness as a generative starting point for community building and kinship, for finding alternative modalities of existence beyond the neocolonial matrix of contemporary Canadian literature. Belcourt finds creative energy in heartbreak, which he writes and rewrites, first as a flirt who texts a personified love, “if i am a haunted house, then let’s make up a theory of negativity that notices the utopian pulse of sad stories like ours,” and then as “an enactment of grief / whereby one ropes strangers by the tongue into a collective wounding.” Potentiality grows out of this “collective wounding,” this agency to theorize negativity but also the self and/in community because “grief is a way of making claim to the world.” Rather than just reclaiming the world, Belcourt imagines new alternatives, subversive counter-narratives to the settler version of Indigeneity that, when “[ontologized,]…[conjures] sadness and death.” The utopian pulse beats against the deadening present, ironically hyperbolic because, if one is to imagine the future, why not imagine it abundantly blissful? In a collection that rejects the delimiting of the human body, the future takes on its own sort of radical embodiment. Belcourt’s is an unbodied poetics. He writes that Indigeneity “troubles the idea of ‘having’ a body”; “sometimes bodies don’t always feel like bodies but like wounds.” But being “wounded” does not have to mean to be “falling apart in a bad way.” To return to Ahmed, if “bodily and social spaces leak into each other [and] inhabit each other…the nation becomes imagined and embodied as a space.” Belcourt decolonizes CanLit by rejecting the nation itself. If the nation is embodied as a space, queer Indigenous literature is resistance as unbodiment. The very idea of “leaking,” of bodies “that leak into worlds,” is queer in its abjecting sort of “grotesqueness,” its refusal to be contained by the temporal vessel of the body. Another queer Indigenous poet, Joshua Whitehead, asks in his online Addendum on Indiginegativity, a sort of letter to Hal Niedzviecki in response to the Appropriation Prize, “Who is CanLit? Is it not a nation-building project?” Belcourt and Whitehead both write within and against CanLit, resisting a settler-colonial state built by language—oppressive language that makes Belcourt feel like he is “maybe…a figure of speech. / [or] maybe [his] body is an inside joke.” He wants out, and “out” in this case means queer, means leaky, means living “indigeneity [that] exceeds and is exceeded by gender.” Whitehead similarly gestures at leaking as productive sadness in his claim that “crying is an act of aggression, [and] tears are rivers that etch space.” Belcourt’s poetry dialogues with such ideas, for example, when he writes, “sometimes my kookum—,” the Cree word for grandmother, “—begins to cry / and a world falls out.” While the visceral and theoretical are ostensibly incompatible, Belcourt’s poems host a revolutionary clash of registers and explode language from within: another iteration of tangible overflow.